On this day upon arrival, our company representative will meet and greet you at the airport, got through a simple series of greeting and short briefing about the trip and the countries at large. Transfer to your lodge for dinner and overnight stay. After a hearty breakfast, drive to kibale forest National Park, in the western region. The drive takes approximately 6-7 hours through Mubende district. Have your warm lunch enroute and proceed to the park. After check in do an evening nature walk and the rest of the evening with dinner and overnight stay at the lodge. Day 4: Transfer to Queen Elizabeth national park. Day 5: Morning game drive, afternoon boat ride. Today get ready for a morning game drive in the medley of wonders, this offers you an opportunity to view the lions, elephants, Uganda Kob, buffaloes and so many animals that dwell on these open savannah grasslands. Return to the lodge for your lunch and thereafter embark on an afternoon boat cruise towards the Kazinga channel famous for the high concentration of hippos, crocodiles and water birds. This morning after breakfast, drive through the Ishasha sector as you head to Bwindi National Park. This is the best spot to view the tree climbing lions, proceed to the park and enjoy an evening community visit in areas close to your accommodation site in Bwindi. Have the rest of the evening with diner and overnight stay at the lodge. 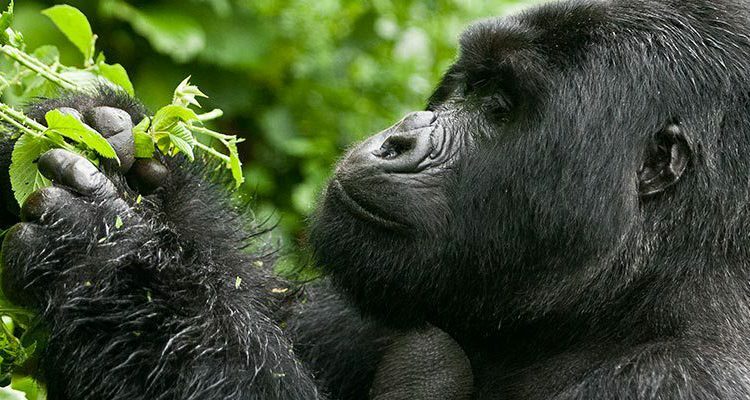 Gorilla tracking is the best activity of the day while at Bwindi Forest National Park. The gorillas occupy the biggest part of the park, as they group themselves under families with the male silverback as the head. Your guides/rangers know where best to find the gorillas in the forest. You will have a whole hour in the forest with these apes as well as a moment to enjoy lunch. After trekking, return to the lodge for diner and overnight stay. Depart Bwindi Forest National park after breakfast for Kabale. The drive is approximately 3-4hrs; enjoy a boat ride or canoe ride on Lake Bunyonyi. The ride awards you with great chances to view the numerous islands on the lake and a number of birds. Day 9: Transfer to Volcanoes Park , Rwanda. Today we cross over from Uganda to Rwanda; the mostly used border is the Katuna Border, which is quite close to Ruhengeri- Musanze. After checking, you can opt to visit the community or just relax at your lodge after the long drive; this will also help you get ready for the gorilla experience. Have the rest of your evening with diner and overnight stay. Today after breakfast, enjoy another gorilla tracking session of Rwanda. Visit the mountain gorilla in the mist as they were presented in the movie, gorillas in the Mist. The experience is such a thrilling one and worth of many memories. After the tracking adventure, drive to Lake Kivu where you will spend the rest of your evening with diner and overnight stay. Day 11: Boat ride and transfer to Nyungwe national park. Day 12: Morning Chimp tracking and Afternoon Canopy walk. Today you have double adventure, and this could be the best day of the whole trip, after breakfast, head to the forest in such for the chimpanzees and the colobus monkeys. After a warm lunch, join your guide for a memorable canopy walk, and b high in the sky with the tree canooies and birds. Have your evening at leisure with diner and overnight stay. After breakfast, depart Nyungwe forest National Park for Kigali city, enjoy a brief city tour depending on your departure time. Your guide / driver will drive you to the airport for your flight to the next destination.